All of us Buffy The Vampire Slayer Fans remember the poignant moment in Joss’ musical episode where the gang asks “where do we go from here?” Whenever I find my self stuck the song plays in my head. After yet another upset brought to Joss by Fox I know he has had that playing in his head too. For Buffy The Vampire Slayer he branched out into comics. Joss then moved the comic into the motion comic medium. Buffy the Vampire Slayer: Season 8 Motion Comic premiered in mid July with each episode releasing every Monday since. 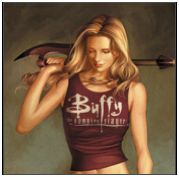 Buffy season 8 will also be released on DVD January 4, 2011. Preorder here!